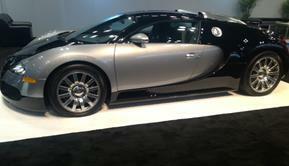 2013 marked the 113th anniversary of the New York Int’l Auto Show. Big names like Toyota, Ford, Acura, Bugatti, Porsche, BMW, Volkswagen (Just to name a few) made their dent at the Jacobs Javits Center this year. With all of revolutionary features and space-age designs of these cars, it seems that we definitely horse powered our way past Henry Ford’s 1896 paradigm shifting, Quadricycle! This year’s exhibit, modeled a wide variety of cars from the low-end, durable vehicle catering to frantic, occupied family household; to the high profile, luxurious, speed demon on the road catering to the thrill seeking bachelor. -and then there was everything else in between. All of these automobiles at the show already gained awareness in the market. However, the question at hand is which brands maintained the relevancy through reinventing improvements to keep up with the tangible and intangible changes in the world? This Japanese automotive company gets the trophy for innovation breakthroughs this year. In a mere 15 months, Nissan redesigned 5 of their models: Sentra, Pathfinder, Altima, Versa Note, and Rouge (releases to the states, May 2013). 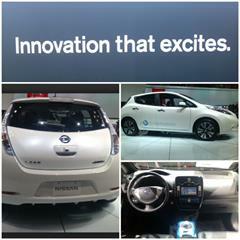 Nissan is “Innovation that Excites” and puts the customer’s concerns and circumstances in the front and center. This shows through their advances. I personally feel that although they didn’t have the most extravagant displays, they stood firm ground with all of the breakthroughs they have under their belt! The cars on the floor targeted the average American looking for something familiar with slight enhancements. Nissan’s technicians fine-tuned everyday features to maintain safety and durability. With zero gravity seats, 27/38 miles on the gallon enhanced headlights, smart keys, computer synchronies for tire pressure and movement detectors, standard security and safety features, and a hard, sturdy body while competitors sported flimsy fiber glass bodies. Nissan’s redesigned offering are cost-efficient and give long time satisfaction. Although the Leaf, the world’s first mass produced affordable electric car, premiered in 2011, it stole the show once more on a turning display platform. This model underlines Nissan’s identity of what innovation that excites means to the world. 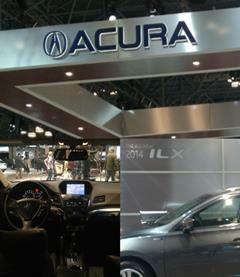 This year, the all-new 2014 ILX definitely was the hype on the Acura floor. This hybrid is an entry-level luxury compact car. The ILX achieved the 2013 Top Safety Pick designation by the Insurance Institute for Highway Safety (IIHS). It’s Sleek interior with smooth leather seats, a strong sturdy outside, and newly designed aero fused dynamics, gives Acura an optimistic sales target of 40,000 units its first year in production. Porsche has done an impeccable job with product placement in the sports car industry Porsche’s display was packed with people while other car companies considered direct competitors, weren’t as full. 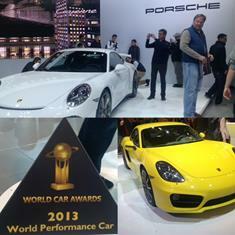 The Porsche Cayman received a World Car Award this year for World Performance Car. . In reconciling with apparent opposites: the tension between comfort and dynamism or between sportiness and efficiency, sports car enthusiasts definitely pay homage to this vintage classic with futuristic twists. I mean who wouldn’t appreciate a sports car without compromises for everyday use. The Bugatti line was actually off the market for approximately 30 years. There is actually a very interesting story involving the Queen of England and this remarkable piece of a car. She bought a Bugatti in the 1970s and got into a car accident due to brake failure. In response to the criticisms that Bugatti received shortly after, Bugatti simply stated that their brand is an “unstoppable” one. Hence, the brake failure! Their vehicles easily can reach 270 mph and goes for 1.5 million dollars. With all of the social media posts being posted the first day throughout its entirety, it was hard to not know about the show. It was impressive seeing families eagerly running after and trying to pacify their children as these models created excitement to their spirits. A lot of the everyday cars seemed to focus on innovations to improve comfort, cost-effectiveness, and environmental concerns while the more elite cars used their reputation of exclusivity to market themselves. These selective cars were behind glass walls and velvet ropes and you had to have some sort of VIP pass to talk to representative. I noticed that there was no type of marketing collateral for these super cars and they were really just there for eye-candy more than anything else. Overall, this year’s Int’l Car Show went very well. The weather was gorgeous which gave people more of an incentive to check it out. It was great experience and if you didn’t have a chance to check it out this year, make sure you do for 2014!